Fit Fluential Mom: Pollen: Nature's Own SUPERFOOD! What Is Pollen and WHY is it so Beneficial? Bee pollen is the food of a young bee and is approximately 40% protein. It is one of nature's most completely nourishing foods containing nearly all nutrients required by humans. About half of its protein is in the form of free amino acids that are ready to be used directly by the body. Bee pollen is a complete food and contains many elements that products of animal origin do not possess. Bee pollen is richer in proteins than any animal source. It contains more amino acids than beef, eggs, or cheese of equal weight. Bee pollen is particularly concentrated in all elements necessary for life. Bee pollen contains all the essential components of life. The percentage of rejuvenating elements in bee pollen remarkably exceeds those present in brewer's yeast and wheat germ. Bee pollen corrects the deficient or unbalanced nutrition common in today's generation of consuming processed, nutrition deficient foods. Nutrient deficiencies and all the health problems they cause are recognized worldwide as a growing problem. Because bee pollen contains all the nutrients needed to sustain life, it is being used on an ever-larger scale for human nourishment and health. Science teaches that bee pollen contains many substances that combine to make it a healthy, nutritious, complete food. There are numerous reports from medical experience that conclusively show the benefits of bee pollen exceed that of a simple food item. And the bees do most of the work. Bee-gathered pollens are rich in proteins, free amino acids, and vitamins, including B-complex and folic acid. "Honeybee pollen is the richest source of vitamins found in Nature in a single food. Even if bee pollen had none of its other vital ingredients, its content of rutin alone would justify taking at least a teaspoon daily, if for no other reason than strengthening the capillaries. Pollen is extremely rich in rutin and may have the highest content of any source, plus it provides a high content of the nucleics RNA [ribonucleic acid] and DNA [deoxyribonucleic acid]." Researchers have demonstrated that there is a substance in bee pollen that inhibits the development of numerous harmful bacteria. Experiments have shown bee pollen contains an antibiotic factor effective against salmonella and some strains of bacteria. On the clinical level, studies have shown that a regulatory effect on intestinal function can be attributed to bee pollen. The presence of a high proportion of cellulose and fiber in pollen, as well as the existence of antibiotic factors, all contribute to an explanation for this efficacious effect. Working with lab animals has demonstrated that the ingestion of bee pollen has a good effect on the composition of blood. A considerable and simultaneous increase of both white and red blood cells is observed. When bee pollen is given to anemic patients, their levels of hemoglobin (oxygen-carrying red blood cells) increase considerably. It is reported that bee pollen in the diet acts to normalize cholesterol and triglyceride levels in the blood: upon the regular ingestion of bee pollen, a reduction of cholesterol and triglycerides was observed. High-density lipoproteins (HDL) increased, while low-density lipoproteins (LDL) decreased. A normalization of blood serum cholesterol levels is also seen. Pollen is also thought to protect against radiation and to have anti-cancer qualities. One of the most important articles ever published on bee pollen comes from the United States Department of Agriculture (USDA). This article, titled "Delay in the Appearance of Palpable Mammary Tumors in C3H Mice Following the Ingestion of PolIenized Food," is the work of William Robinson of the Bureau of Entomology, Agriculture Research Administration. It was published in the Journal of the National Cancer Institute way back in October 1948, five decades ago. According to the article, Dr. Robinson started with mice that had been specially bred to develop and subsequently die from tumors. He explains, "The age at which mice of this strain developed tumors ranged from 18 to 57 weeks, with an average appearance at 33 weeks. Tumor incidence was 100 percent." Given the fact that cancer is the number-two killer in the United States (heart disease is number one), we can all certainly agree that this is an electrifying article. What happened from it? Nothing. Even the National Cancer Institute, which published it, failed to follow up on this very promising line of research. It was dropped with no explanation. More good news comes from the University of Vienna, where Dr. Peter Hernuss and colleagues conducted a study of 25 women suffering from inoperable uterine cancer. Because surgery was impossible, the women were treated with chemotherapy. The lucky women given bee pollen with their food quickly exhibited a higher concentration of cancer-fighting immune-system cells, increased antibody production, and a markedly improved level of infection-fighting and oxygen carrying red blood cells (hemoglobin). These women suffered less from the awful side effects of chemotherapy as well. Bee pollen lessened the terrible nausea that commonly accompanies the treatment and helped keep hair loss to a minimum. The women also slept better at night. The control group receiving a placebo did not experience comparable relief. "An increase has been recorded in the level of blood lymphocytes, gamma globulins, and proteins in those subjects given pollen in comparison with control groups. The most significant difference occurred in lymphocytes. These results thus signify a strengthening in the resistance of the organic system." Lymphocytes are the white blood cells that are the "soldiers" of the immune system. They are responsible for ridding the body of injurious and harmful substances, including infected or diseased cells, mutant and cancerous cells, viruses, metabolic trash, and so on. Gamma globulin is a protein formed in the blood, and our ability to resist infection is closely related to this protein's activity. Pollen stimulates ovarian function. The best results were obtained with a pollen supplementation of 2 parts per 100 in the ration, and with the substitution of animal proteins with pollen in a proportion of 5 parts per 100. The intensity of ovulation increased. Parallel to this increase in ovulation, pollen also improves the ability of eggs to withstand the incubation period. The best results were obtained with a quantity of 4 parts per 100 of pollen added to the ration, resulting in an increase in the percentage of eggs in respect to the control group. The application of pollen is recommended whenever the end result is obtaining eggs for reproduction. Bee Products Also Treats Allergies! Pollen is also a remedy for hay fever and allergies. However, it must be taken at least six weeks before the season begins and then continued throughout the season if it going to work. Bee pollen has been effectively used down through the ages to rid allergy sufferers of their afflictions. This technique, called desensitization, was developed at St. Mary's Hospital Medical School in London soon after the turn of the century. The treatment consists of administering small amounts of the allergen to stimulate the patient's own immune system to produce antibodies that will eliminate the allergic reaction. It works rather like a vaccination does against childhood diseases. Desensitization is based on the premise that the administration of the allergen will cause the body to produce antibodies that will cancel out the effects of the offending substance when the patient is again exposed to it. Leo Conway, M.D., of Denver Colorado, treated his patients with pollen. Dr. Conway reported: "All patients who had taken the antigen [pollen] for three years remained free from all allergy symptoms, no matter where they lived and regardless of diet. Control has been achieved in 100 percent of my earlier cases and the field is ever-expanding.” Since oral feeding of pollen for this use was first perfected in his laboratory, astounding results were obtained. No ill consequences have resulted. Ninety-four percent of all his patients were completely free from allergy symptoms. Of the other six percent, not one followed directions, but even this small percentage were nonetheless partially relieved. Relief of hay fever, pollen-induced asthma, with ever increasing control of bronchitis, ulcers of the digestive tract, colitis, migraine headaches, and urinary disorders were all totally successful. Unfortunately, Dr. Conway, an early pioneer in the field of allergies, is now deceased. What we did not know was just how lightning-fast it could bring relief. It actually eliminated longstanding symptoms in minutes. Everything from asthma to allergies to sinus problems cleared. These trials confirmed that bee pollen is wonderfully effective against a very wide range of respiratory distress. Lananaki, coach of the Finnish track team that swept the Olympics in 1972, revealed, "Most of our athletes take pollen food supplements. Our studies show it significantly improves their performance. There have been no negative results since we have been supplying pollen to our athletes." "Bee pollen works, and it works perfectly. Pollen allows super-stars to increase their strength and stamina up to 25 percent. This increase in strength and endurance may be the key to the secret regenerative power of bee pollen. Bee pollen causes a definite decrease in pulse rate. The whole beauty of bee pollen is that it's as natural as you can get. No chemicals. No steroids." Renowned German naturalist Francis Huber was a great proponent of this miraculous food from the hive. Huber called bee pollen "the greatest body builder on Earth." Bee pollen works wonders in a weight-control or weight-stabilization regimen by correcting a possible chemical imbalance in body metabolism that may be involved in either abnormal weight gain or loss. The normalizing and stabilizing effects of this perfect food from the bees are phenomenal. In weight-loss programs, bee pollen stimulates the metabolic processes. It speeds caloric burn by lighting and stoking the metabolic fires. Honeybee pollen is coming to be recognized as Nature's true weight-loss food. Bee pollen is a low-calorie food. It contains only ninety calories per ounce. (An ounce is about two heaping tablespoons.) It offers 15 percent lecithin by volume. Lecithin is a substance that helps dissolve and flush fat from the body. This is one reason why bee pollen lowers low-density lipoproteins (LDL) surer and faster than any other food while helping increase the helpful high-density lipoproteins (HDL), which science says protect against cholesterol and heart disease. By boosting the value of each nutrient present in the food you eat, bee pollen also eliminates cravings. Its natural phenylalanine content acts as an appetite suppressant. Phenylalanine is a natural amino acid that the body requires. It acts on your appestat, the control center that signals fullness and hunger. Mother Nature knows what she's about. 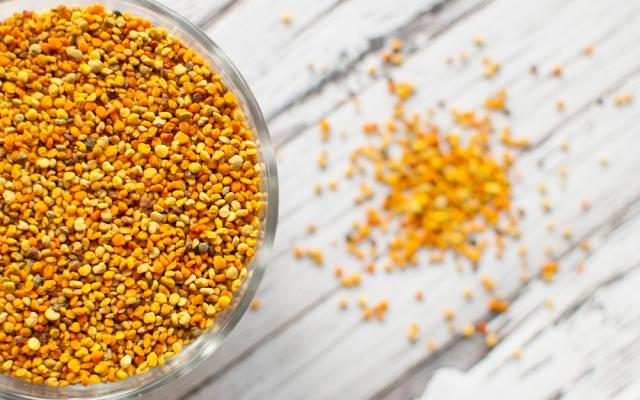 You just plain won't want to eat as much when you take bee pollen regularly. When you are overweight, phenylalanine exerts a natural appetite suppressant effect. When you need to gain weight, the phenylalanine in bee pollen works in reverse. The chemical drug in over-the-counter weight-loss products is a manmade cousin of phenylalanine called phenylpropanolamine, which chemically depresses the appetite whether you are fat, thin, or just right. It can also give you the jitters and leave you with a drug-induced "hangover" and can be addictive. Phenylpropanolamine is a common ingredient in many decongestants, explaining why one of the side effects of these products is loss of appetite. Products that include phenylpropanolamine as an ingredient must by law carry a warning that they should not be taken by persons with certain conditions, including thyroid problems and high blood pressure. Basic beauty begins with the glow of good health, which shines from within. A scrubbed and radiant complexion transforms anyone into a singularly attractive person. On the other hand, dull, muddy skin, often caused by poor nutrition or personal hygiene, can detract from even the most attractive. Studies have shown that unhealthy or aging skin can be dramatically improved by the consumption of honeybee pollen. When bee pollen is included daily in the diet, it not only gives you the glow of health and aids in safe, permanent weight loss, but it can also be blended into seemingly "magic potions" to smooth, soothe, and rejuvenate every inch of the outside of your body. Several relatively inexpensive mixtures of hive products, used externally, can revitalize and rejuvenate the complexion and may even eliminate acne. Dr. Lars-Erik Essen, a dermatologist in Helsingborg, Sweden, pioneered the use of bee products for skin conditions. He treated many of his patients successfully for acne. Dr. Essen says, "Through transcutaneous nutrition, bee pollen exerts a profound biological effect. It seems to prevent premature aging of the cells and stimulates growth of new skin tissue. It offers effective protection against dehydration and injects new life into dry cells. It smoothes away wrinkles and stimulates a life-giving blood supply to all skin cells. The skin becomes younger-looking, less vulnerable to wrinkles, smoother, and healthier with the use of honeybee pollen," Dr. Essen says. "Taken internally or used externally, bee pollen exercises a suppressive effect on facial acne. It is also an important skin rejuvenator, primarily because it contains a high concentration of the nucleic acids RNA and DNA as well as a natural antibiotic factor." The French, long noted for their preoccupation with all things beautiful, have done a great deal of research on the use of bee pollen and other hive products in cosmetic preparations. Dr. M. Esperrois of the French Institute of Chemistry notes that honeybee pollen contains potent antibiotics that can act to reverse the effects normal aging exerts on skin, correcting darkening, wrinkles, and blemishes. This blog post was taken as an excerpt from Mercola's article titled "Bee Pollen as Superfood". Some sections were removed and others were added from personal experience.